A beautiful, large, coffee-table book of the first 50 years of American space program. 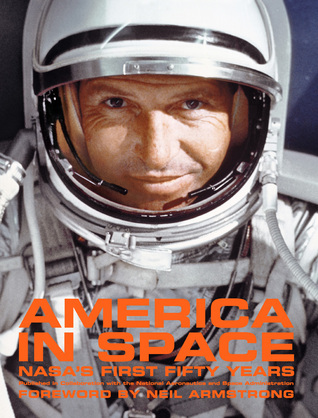 The book is chock-full of fascinating photographs chronicling the first fifty years of America's space program. The book and photographs are very large and therefore a great deal of detail is captured in every image. As a NASA and photography enthusiast, I have thoroughly enjoyed this book. Awesome book! You should watch "When we Left Earth" and then look at this book. Or you can do them at the same time. I'm not gonna tell you how to live your life. But definitely do both. The pictures in the book are beautiful and awe inspiring. Beautiful. Gorgeous pictures from throughout NASA's history, with just enough text in the blurbs to explain what's going on without getting too technical or distracting from the images. A must-have for fans of space travel and technology. Kept in living room for awhile. Great pics and amazing look at the history. Written content is thin but awesome to sit back relax and imagine being there. Nice photos, but surprisingly too many typos and outright errors in the captions for me to consider purchasing it. It was very informative and gave some information that I never knew. I would defitnitley recomend this book to others. This is a cool coffee table book with some amazing pictures from NASA. Not amazing enough to make me consider trading in my ottoman for a coffee table. 3 stars. A history of NASA and the United States' space program during its first fifty years covering it triumphs and defeats.